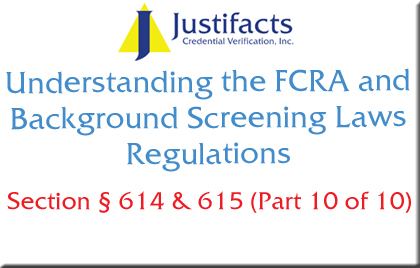 Sections 614 and 615 deal with the restrictions on reporting of adverse information and how to communicate adverse action to applicants. Whenever a consumer reporting agency, such as Justifacts, prepares an investigative consumer report (background check), no adverse information in the consumer report (other than information which is a matter of public record) may be included in a subsequent consumer report unless such adverse information has been verified in the process of making such subsequent report, or the adverse information was received within the three month period preceding the date the subsequent report is furnished. C. Provide to the consumer an oral, written, or electronic notice of the consumer’s rights to obtain, within 60 days, a free copy of a consumer report on the consumer from the consumer reporting agency and to dispute with a consumer reporting agency the accuracy or completeness of any information in a consumer report furnished by the agency. We must respect the fact that applicants have the right to dispute adverse information found in their background check. Background check companies restrict their ability to add adverse information in any subsequent reports for an applicant. Furthermore, if adverse information is reported on an individual, measures must be taken to provide that individual with the adverse information that is being used against him/her. An applicant must be given the right to directly contact the consumer reporting agency that has conducted the background check on him/her and request a copy of that background check.